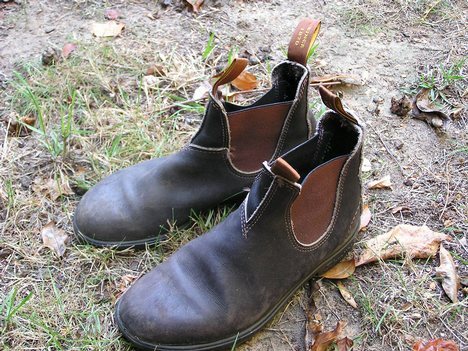 Also, I have the same boots, though instead of getting polished, mine are regularly coated in mud. Poor things… If only they knew how well other queers keep their boots, I’m certain they’d leave me. You do? That’s so cool:-) Polish and Mud the difference, betwen Feral and Bookish… Vive La Difference. Do you own only one pair of boots at a time? Like, you get a pair, wear them out then buy another? I can’t begin to imagine wearing one pair of shoes or boots daily. I mean, I have 2 pairs of dark brown western boots (who could live in TX w/o them?! ), 1 pair of really cool purple boots, 2 pairs of black boots–1 western, 1 motorcycle–, and 1 pair off white/tanish boots…thats just my ‘regular’ boots. Of course, I have rain boots, hiking boots, etc. I can’t even big to name my shoes, running athletic shoes, tennis athletic shoes, casual athletic shoes, etc. Hmmm…as I consider how long it takes me–daily–to decide which shoes or boots or sandals to wear, I think I am a bit jealous of the simplicity of your choice i. e., get up, put on your boots:-)…just not jealous enough to give up my footwear! “Our life is frittered away by detail…simplify, simplify, simplify…”while I believe in Thoreau’s exhortation theoretically, it seems that you may actually live it. Kudos.